The TCS3430 sensor from ams provides break-through optical filtering functionality that produces measurements of illuminance and CCT which closely match that of the human eye. Though it’s was released back in July, the new ams TCS3430 true color sensor IC is getting a lot of press. This sensor provides digital measurements of illuminance (brightness) and chromaticity (color) that meet the CIE 1931 “Standard Observer” XYZ scaling. CIE 1931 is the industry standard which quantifies a human’s perception of light and is our best benchmark for “true color” from a human’s perception. 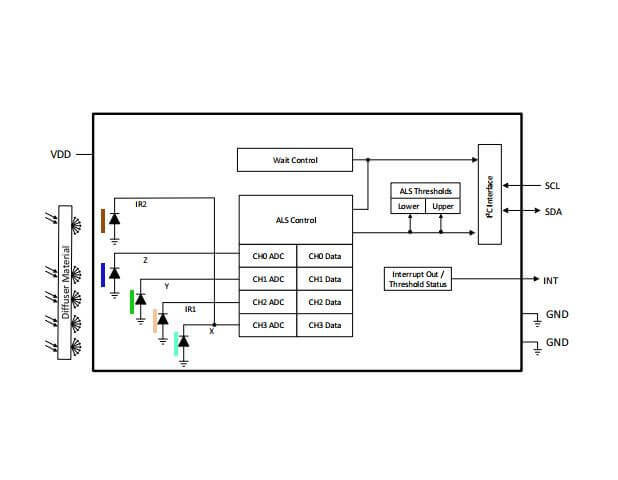 Because of this break-through functionality in a miniature package, this sense IC applies to a variety of consumer products such as cell phones, tablets, and the like. The functionality enables these devices to provide better display management, automatic white color balancing, and color management. Improved adaptation of LCD color and brightness toward warm or cool white based on ambient conditions. Better display calibration to offer improved color balancing and crisp images based on the input. Near zero color distortion from the camera, offering users the same performance of professional-grade photography equipment. From a technology perspective, the TCS3430 is fabricated based on proprietary IP for interferometric optical filters directly on a silicon wafer. These interferometric filters are made with special features of the XYZ spectral responsivity model of a human eye. The filters have five channels: X, Y, and Z along with two infrared channels. The infrared channels are used for light source detection. The Y channel’s responsiveness to the green portion of the visible light spectrum gives a measure of illuminance. This gives the TSC3430 the ability to operate as an ALS and a color sensor. Aside from the specs, the color sensor is packed in a tiny 2.41mm x 1.75mm x 1.00mm footprint. The sensor does need an achromatic diffuser and is usually mounted behind clear or dark glass. It is powered by 1.8V and communicates via an I2C interface. The TCS3430 is the smallest true color sensor on the market today. This new product will fit comfortably in the smallest consumer products and offer another stride in enabling a positive user experience for consumer products.